New Packaging Concept for Beer. The consumption of beer has stagnated on most markets, including the European. The volume consumed by traditional beer drinkers (men above 30-35 years) is rather stable, whereas new generations of consumers (young men and women) more often seem to prefer wine to beer. To secure a positive long term development, beer trade has to attract the young consumers too. In Europe, the intensified competition on the beer market has resulted in concentration to 3 big groups: Interbrew, Heineken, and Carlsberg. Due to strong marketing efforts, the major beer brands have increased their market shares. One way these groups have strengthened their image and profile, is by using new packaging concepts, such as embossing of cans, or PEN and PET bottles. 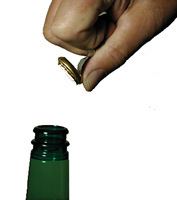 Research shows beer keeps better in glass bottles than in cans! A Brewing Research Laboratory in U.K. (Brewing Research International) recently published a report from a study indicating that beer keeps its flavour longer in glass bottles than in cans. One reason mentioned was that canned products had higher oxygen levels compared to bottled products, thereby contributing to greater flavour instability. 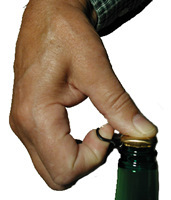 The crown cork was patented 1892 in USA and has since then, due to its excellent sealing performance, been the dominant closure on the beer market. However, since safety is a more vital aspect for the society and the food and drink industry today, the crown cork has some shortcomings. 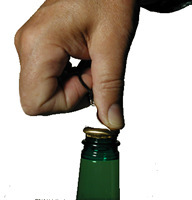 The crown cork is not tamper proof, and it requires a tool to be opened. The MaxiCrown cap provides the same sealing performance as the crown cork. In addition, it gives a seal which is secure and easy to openas easy to open as a can! Another advantage is that, since MaxiCrown is made out of non-corrosive materials, it never leaves a ring of rust around the bottle neck (like crowns sometimes do at high humidity). Read about more advantages here! The MaxiCrown cap preserves the appearance of the crown cork, due to its aluminium shell and the way it is sealed. In addition, the ring and the total design give an overall modern image, focusing the consumer's attention to the bottle. For 25 years we have had a close cooperation regarding MaxiCrown Sealing System with Japan Crown Cork Co Ltd, (JCC), a subsidiary of Toyo Seikan Kaisha Ltd, the leading Japanese Packaging Group. JCC has developed the New MaxiCrown Cap with aluminium shell and HDPE ring. We have adapted MaxiCrown Conversion Kit to provide an optimal sealing of New MaxiCrown, resulting in ONE INTEGRATED SEALING SYSTEM. Any crowner can be converted to also seal MaxiCrown providing first class sealing performance, capacity and reliability, giving highly satisfied customers. We have made more than 100 installations of MaxiCrown Conversion Kit in Europe, and a great number has been made by Japan Crown Cork in Asia too. We are the world market leader for ring pull sealing systems, for glass as well as plastic bottlesand our aim is to remain so! Our policy is to exclusively market the sealing system (the cap and the sealing equipment) as one integrated unit, to maintain achieved quality.